A couple of Saturday nights ago, my husband Will and I went out on a date. We are not particularly good at having consistent date nights. Sometimes we get on streaks, but we are more likely to enjoy a glass of wine at home. But on Saturday, September 15th, we had plans. I got tickets online to a documentary about Detroit that Will suggested we see. The only place it was showing was at an artsy type of theatre in DC (oddly ended up meeting the director before the show). I figured we’d hit the Four Seasons Hotel in Georgetown which happens to have a lovely little outdoor courtyard with interesting drinks and fried pickles. We found a parking space not far from the theatre, and then started walking. I found this statement intrinsically irritating. “When did we turn eighty?” I responded. We considered alternatives including the Brickskeller, which the iPhone informed us is permanently closed and would’ve been a longer walk for this suddenly feeble couple anyway. We quickly descended into that horrid dating abyss of no man’s land: how could we still fall into the pit of indecision after more than twenty years of doing this? We decided to just start walking and pick out a new place. We stumbled upon a place called Ris. We asked to sit outside for drinks and appetizers, and they said they could seat us “at the back of the patio.” When the seating hostess returned, she was told “take them to the back of the patio.” We stayed in “the back of the patio” for about twenty seconds. No to Ris. Onward. We then decided to go to Kinkead’s which was probably another five or six blocks away. I have fond memories of eating there many years ago as a summer associate at a DC law firm, but when we got there, none of the appetizers sounded too tantalizing. I was looking at the map on my phone as the bartender set down our drinks. “Oh look, I’d love to try this Peruvian place.” I said, handing Will the phone. We downed those drinks like it was a drinking contest and scooted on over to El Chalan, two blocks away. We now had only forty-five minutes before we needed to head back for our movie. But it was the best forty-five minute date I’ve had in my life. It was magical. The food was amazing. The pisco sour better than a margarita. Everything was incredibly flavorful. And I loved the understated ambience. A man playing the guitar was making his rounds, taking requests. He sang Peruvian favorites and “To All the Girls I’ve Loved Before.” One lady celebrated her birthday and was serenaded. She had the most contagious, embarrassed laugh I’ve ever heard. Oh was she elated by the attention. Amazing how fun it can be to witness someone you don’t even know have a great time! A week later, we took the boys and my mom to El Chalan. It was too early for the entertainment but everyone agreed the food was wonderful. On Monday I realized that I didn’t have my wallet when I met a friend for lunch and had to have her pay. Nice. If you know me, it’s probably not terribly shocking. Misplacing my wallet is a skill I have. I’m amazing at it. I tried to retrace my steps. I knew I had it on Saturday afternoon, but couldn’t picture having it anywhere but in the car that day. When by Tuesday my wallet just wasn’t showing up, and my online checks of my credit cards showed no use, I decided to call El Chalan. I had zero expectation that they’d have it because Will was there, why would I take my wallet along? On Tuesday night my sister, Laurie, had a layover in DC and her hotel was just a few blocks from El Chalan. Obviously I had to go pick up my wallet, so we met, along with her daughter, at El Chalan. It was the third time I had been there in ten days, and it was just as fantastic as that first night. I had the same waiter all three times, and his winsome smile is without parallel. Grace upon grace. From a redeemed date night to protecting my wallet to enjoying El Chalan three times in ten days with a significant contingency of all my favorite people. Grace upon grace. The story of my life. Sometimes we can get hung up on emotion. We can put things off, or decide against some worthy pursuit because we just don’t feel like it. And that’s often a mistake, because feelings can be overrated. If I only ran when I felt like it, I would never take a single stride. Ever. But it is a truism that right feelings follow right actions. I have lived this out in so many areas of my life, from not feeling like making a phone call to heading to the gym to attending a meeting to making dinner to volunteering at church. If I do the right thing, I often find that I like it and that being “all in” is somehow emotionally recharging. My pastor, Lon Solomon, spoke about this on Sunday, but with more eloquence and imagery. He said our feelings are the caboose of the train, and that the engine leading the train is the truth of Scripture. For example, we may not always feel like God loves us so much that He sent His Son to save us, but that’s the truth, and when we act on the truth eventually that caboose will come around. I highly recommend checking out Lon’s last three messages — truly some of his very best (Genesis: Our Salvation in Christ, Parts 1, 2 and 3). So the question is, where is a lack of feelings constructing a road block in your life? Where are you not believing that the caboose will eventually arrive? Are you caught up in appearances when the truth is that God looks at the heart? Are you feeling down and dejected about all that you fail to get done (my house is almost never clean, the laundry is never done, and I am a terrible friend in terms of answering phone calls and emails)? Because our value and identity should be found in Christ and His grace — never our accomplishments. May we live according to the truth that right feelings follow right actions, obeying and clinging to God’s Word, confident that before too long the caboose will come chugging into view. This morning I am writing in my prayer journal at Caribou Coffee in Shirlington, Virginia. Not a usual spot for me, but I just dropped my sweet mom off at the airport and I love this little area, so full of pedestrians, and oddly, dogs. This Marriage Monday I am praying that I will be committed in my marriage, that I will build Will up, that I will love and respect him unconditionally. And I am praying this for my friends and family as well. Ruth Graham, the wife of Billy Graham, who passed away in 2007, said that “a good marriage is the union of two good forgivers.” I want to be a good forgiver, and pray that my husband will continue to be one too. May we all be expert givers of grace! Paul wrote that love “keeps no record of wrongs.” A pretty amazing statement if you stop to think about it. Not a short record, not a brief record. No record. Wow. How different would our world look if lots of us tapped into the supernatural power of the Holy Spirit to forgive our spouses and keep no record of wrongs? This week I took the boys for their annual pediatric check-ups. This is an event I dread because the little rooms that they put us in usually induce bouncing-off-the-wallness like nothing else, and we are invariably trapped there for half a day. But on Wednesday we smashed all records for in-and-out times and got healthy, albeit brief, reports all around. The doctor asked mostly about Sam. Doctor: How are his gross motor skills? Me: Well, he swims on the swim team. Doctor: How are his fine motor skills? Me: Oh, he has beautiful handwriting. Doctor: How about his speech, any concerns? Me: Well, I guess there are some. Like fox, say “fox” Sammy. The doctor smiled and reassured me that this was normal. As if I needed reassurance! I treasure “udder” and “brudder,” and most especially “da brudders.” But I probably wouldn’t have with Will or Nate. I probably would’ve worked with them on letter sounds and not relished every single mispronounced word. But Sam’s my baby, and time is slipping away from me. The first ten days of school have already changed him. He’s maturing at hyper-speed now. It’s absolutely wonderful and I absolutely hate it, all at the same time. But it’s not just that Sam is my baby, I treat him differently because I don’t subscribe to the family fairness doctrine. I think it’s a crock. The assumption of “fairness” is that people are the same, that one parental style fits all. But these boys of mine are as different as different can be. Why on earth would I try to treat them just the same? That just strikes me as utterly, udderly moronic. Sam is tactile, needs to cuddle and is extremely sensitive. Nate is brilliant, but scatterbrained and benefits from reminders with regard to just about everything, including things that you’d be pretty surprised he’d need reminding about. Will is driven and focused, but needs lots of guidance about how to not take everything so seriously. If I know them and love them — and oh do I — then our relationships will look and be completely different. This doesn’t mean I love one more than the other. How would that even be possible when I love each of them with my whole heart? I look at each of their little faces and am in awe — I’m cuh-ray-zee about each one. If you have more than one child, I’m sure you know just what I mean. And this is just a taste of what it’s like for Jesus. He loves each of His creations with an infinite, unquenchable love. I hope you live each day embracing the truth that the All-Loving Creator of the universe loves YOU as a uniquely created being, made in His image. I hope you know that you are called to uniquely reflect some part of God Himself. May any light shining that I do be about glorifying God and not myself. May I not compare or even consider “fairness,” but do all things as unto the Lord, with the assurance that I am loved. 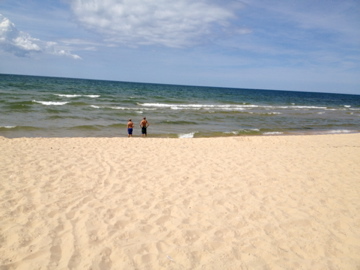 As I’ve mentioned I am fortunate to vacation on Lake Michigan each August. The beach pictured above is one of my favorite places on earth, and every year while I am there I get to see the same gal pals. One of my pals is Pearl. Pearl and I are kind of related, in a very remote way. Pearl’s husband’s grandfather was my grandfather’s brother. Regardless, I adore Pearl, as does every single person who has ever had occasion to meet her. What a gift that I get to hang out with her and borrow her comfy beach chairs day after perfect day. One gorgeous afternoon last month, Pearl and I were hanging out on the beach when she shared with me the key to a happy life: no expectations. Although Pearl has a way of making every conversation hilarious, and we were definitely laughing a lot about this “no expectation” philosophy, this wise mother of five boys was also being serious. And she’s right. Expectations matter. A lot. Later that same night we were at a “talent” show. We were not participants, but sort of just passing through. The two acts that we saw were not of the highest caliber, to say the least. “Low bar?” Pearl asked, smiling and yet perplexed. “There’s no bar!” And it was one of those moments where you are so on the same page that you can just laugh and make the connection at the same time, without a single word. Low bars and low expectations are fine — dandy, in some circumstances, like family talent shows. But living with no bar, free from expectations is something different, something truly profound and freeing. And this is not a defeatist attitude; it’s not because you’ve been disappointed before (although who hasn’t been?). It’s not giving in and saying “oh well, I don’t care.” It has nothing to do with apathy. It has everything to do with trust — trusting that God has a plan. That you don’t have to figure it out. That He is Good. That He will take care of you. Whenever we experience disappointment, we should examine our expectations. I had occasion to do this just yesterday. I had such a great morning, but then was discouraged and disappointed about a couple of things in the afternoon — oh the highs and lows of life. Grumbling about it to my sympathetic husband didn’t help much, but an honest assessment of my expectations did. Reminding myself that only Jesus never fails helped a lot. In Ann Voskamp’s One Thousand Gifts she says that her mother often warned, “expectations kill relationships.” So often this proves true. Where is the life being choked out of you because of someone’s expectations? And where are you doing the choking? We can’t truly live without any expectations of anyone. But we can resolve to be aware of them, to recognize that they matter, and that unrealistic expectations are a sure path to disappointment. Paul says that he learned to be content whatever the circumstances (Philippians 4:11). He couldn’t do that without the help of the Holy Spirit, and an omnipresent awareness that expectations matter. May I follow Paul, as He follows Christ, and be content no matter my circumstances! I have been married for nearly seventeen years, which is a long, long time. Of course, that by no means makes me any kind of an expert, but I am grateful to love Will and be loved by him still, after falling hard for him more than two decades ago. But I also believe that marriage requires commitment and intention not just when you are starting out, but every single day. I was twenty-three when I took a vow to love Will forever — I had no appreciation for what that meant. I naively thought that being enraptured with him — his personality, his brains, his wit, his smile, his eyes and his tall, strong stature — would be enough. Silly me! And I don’t know about you, but I am devastated when I hear about marriages busting up. Have you gotten an email with that heart-wrenching news from friends of yours? I’m sure you have. It’s terrible, isn’t it? I’ve been convicted that I don’t pray enough over my own marriage or the marriages of my friends. Hence, Marriage Mondays! I am committing to pray for marriages each Monday and I’d love it if you’d join me. I spent some time today, just going through my family and friends and praying for their marriages. I’ll be doing this each Monday, and I will also try to share a thought or two from some of the great books I’ve read about marriage. As always, I would welcome your contributions as well! My son, Sam, has now completed six days of kindergarten. A feat, in my book. This little five-year-old of mine may be as tall as many eight-year-olds but looks are deceiving: trust me, he’s a baby. He has baby soft skin, an eggshell little psyche and the simplistic outlook of a toddler. The other day I asked him if he liked his teacher. His teacher is a princess — she’s gorgeous and gentle and kind. But do you know what Sam’s definition of a princess is? A person who wears skirts. For years now, if I don a skirt, any kind of skirt, he says, “Mama, you are a princess!” What an easy audience. Love him. Of course, he’s not always an easy audience. He can be harsh. Don’t think I’ve confessed here on the blog that Sam ends up in our bed every single night. He arrives and firmly slaps the mattress three times, sort of like a rude and presumptuous knock. And then — depending on which side he’s gone to — one of us heaves his sixty-something pounds up and over into the middle. I would guess most nights this happens between 4 a.m. and 6 a.m., but every morning I wake up next to Sam, oftentimes cheek to cheek. And I’m assuming you know what it’s like to wake up next to someone, but if by chance you don’t, I’ll go ahead and tell you that you may not be greeted with baby sweet breath. Well, a couple weeks ago, I was lying in bed, mostly awake, trying to convince myself to climb out and head down to the coffee. Sam was there, of course, and Will was standing at the foot of the bed, dressed for work. It was at this point that Sam made his declaration: “I smell evil,” he said. It was one of those lines that you repeat in your mind. Did he just say, ‘I smell evil?’ Yes, he did. He just said, ‘I smell evil.’ Hilarious. Sort of takes dragon breath to a new level. I’m quite sure I’ll never forget that one. I mean how many five-year-olds can insult and entertain in such an artful and biting way? Plus it sounds a little freaky too, like it’s a sixth sense or something. But I also think it’s interesting on a spiritual level: Sam believes in evil. I don’t know what his toddler version definition is, the way I do with “princess,” but he knows there is a force at work in this world that is not good. And I’m proud of Sam for that because there are people out there who deny it. I think it’s intellectually dishonest — how can you live in this world and not believe in evil? But they’re out there. These people aren’t willing to concede evil because it leads them down a path where it’s really hard to deny the existence of God. But honest people, even people that are still babies in many respects, know that evil exists. Do you have a healthy reverent fear of an all-powerful, omniscient, holy God? Because that’s the beginning of wisdom. Do you acknowledge evil as a force at work in the world? Because shunning it is understanding. May we cling to the all-loving, all powerful person of Jesus. May we not avert our eyes from following and trusting Him, but may we also not be foolish and pretend that evil isn’t a force in this world. It’s there. Sam can smell it.